When Meghan, owner of Rakun, was very young, her and her sister begged their dad to drive them down to the city market in Kansas City so they could peddle flower pens and hemp necklaces. Selling things they had made by hand was intoxicating, and she decided that she would always be a maker. Since then, she has always had a crafty business project tucked in her bag. She has carefully embroidered tiny things while bumping along the road to Tibet, and lounged on beaches from Thailand to Michigan carefully sorting jewelry findings. Even when she had desk jobs, her crafty business materials were always there, tucked in a drawer, ready to be poured over between spreadsheets and conference calls. When Meghan’s daughter was born in 2010, she took a break from her bohemian ways, but remained a maker. In 2011, she opened a small brick and mortar in Denver carrying all local design. She wanted to share all she had learned with aspiring makers, and a lovely community developed around the shop. In 2015, Meghan and her husband decided to return to their roots in Kansas City. So they packed up the little boutique and continued on a brand new adventure. Now, little Eloise is old enough to be Meghan’s travel companion, so her creativity is once again bursting with inspiration from around the world. The only thing Meghan loves more than making cute things every day is helping other makers reach their goals! After several years of running a trade organization for makers and a little shop carrying handmade goods, she is working on her own line fulltime and consulting on the side. She loves making cute and tiny things! RS: I’ve had a handmade business in some capacity since I was very young. My sister and I made friendship bracelets and my dad would drive us to the farmer’s market to sell them. Sometimes, my handmade business has just been a distraction from the monotony of a “regular” job, but it has often been my full time gig. 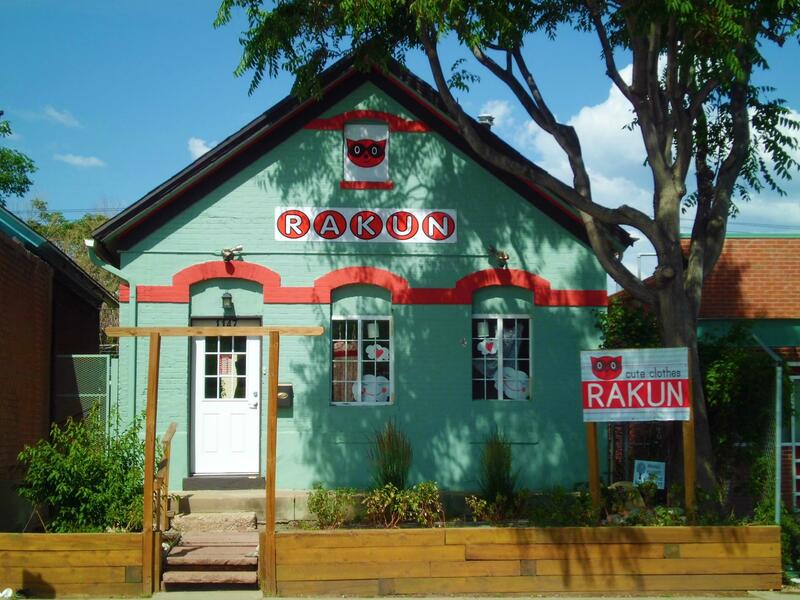 I opened my current business, Rakun, when I was living in Denver in 2011. I wanted a brick and mortar where I could sell my own handmade jewelry and clothing while providing a nurturing business incubator for other makers. From 2011-2015, I sold the work of over 200 local makers and worked with many more. Since then, I’ve moved back to my hometown of Kansas City, closing the brick and mortar but keeping the business name. I currently make a lot of jewelry from my own illustrations that I sell in other boutiques and online, but I am equally passionate about helping other makers achieve their dreams. I probably spend more time working in a consulting capacity these days than I do on my actual products. RS: When I had the shop, all the makers were involved on some level, and I had a core cooperative of about 6 makers. Now, my husband and I work together on the illustration side of things, and the consulting aspect of the business is all me. It’s nice to return to something simpler and quieter. I have more time to stretch my mind. PM: What inspired you to start your company Rakun? RS: My mom is an artist and my dad is an entrepreneur, so my sisters and I were always encouraged to do what we loved and be creative every day. Prior to opening my shop in Denver, I was helping my dad’s business and travelling a lot for work. My daughter was born in 2010, and I didn’t want to always be on the road missing out on spending time with her. I wanted her to have the same experience I did as a child: watching strong entrepreneurs make their own way. She has been an inspirational part of my business from day one, and it is so fun to see her takeaways from being around lots and lots of mom bosses. RS: I have worked for my family since I was a child, so I grew up in a business setting. I didn’t go to business school, though, so sometimes I have to call my dad and have him walk me through forecasting and costing and other left brain things. I’ve been going this long enough that I feel like I have the hang of it, though, and I think hands-on learning is best of all. RS: My brick and mortar was in an old house zoned for business. We bought it with the intention of making it a live/work, naively daydreaming that it would be as easy as hanging a sign and opening the door. It was a costly and daunting endeavor with lots of resistance from the city because, while zoned commercial, we had to change the use from residential to commercial. That wasn’t easy to do, but it was such a cool experience and the shop was so fun in the end. RS: I have to do the things I want to put off first. If I have even a hint of procrastination, my creativity is stifled. It also keeps me calm if I know the bills are paid and the tricky orders filled first. RS: My 6 year old daughter is the inspiration for everything I do. She is so full of light and creativity, and, since a lot of products I make are aimed at younger girls, she is a great critic, too. I find myself making products that I know will enrich her life. For example, I made some soft book story dolls about the seasons when she was really fascinated by winter thawing into spring, and now I’m working on a series about inspiring women from history to share my role models with her. My husband is a very perfectionistic landscape designer, and we often collaborate on some of the pieces that require illustration, like our recent map project. He is so detail oriented, that I run everything by him. Since we both run small businesses, are lives are really intertwined. We don’t compartmentalize work time and family time; it is all sort of rolled into one and my husband and I rely on each other’s feedback a lot. I think creative problem solving as a family makes us all closer. My husband and I are intimately aware of how each other’s mind works, and we can sense when the one of us is facing something particularly challenging. RS: I love T Rex. In Denver, I was really involved in the fashion design scene, too, and all my fashion shows were set to T Rex songs. RS: I wander. Walking simultaneously clears my mind and gets my thoughts rolling. I find clarity on long rambles through town or especially natural settings. I love collecting sea glass, pine cones, and other treasures and just drifting along, losing track of time. RS: My work is constantly evolving because I love learning new things and exploring different techniques. I’ve almost always made some sort of jewelry, but I’ve also made clothing, makeup, and dabbled in natural dyes. Lately, most of my jewelry pieces are made from tiny watercolor paintings, and I’ve been working on a line of necklaces and stories inspired by strong women from history called Tiny Joys of Mighty Women. From Frida Kahlo and her love of animals to Amelia Earhart and her quest for adventures, the series is a reminder that life is lived as much in small pleasures as it is in big accomplishments. I studied creative writing in college, and I really want to start incorporating stories into my work, especially as my daughter discovers the magic of reading. However, my husband and I just inherited a screen printing press, so there might be some t shirts in our future, too. I like to stay flexible and curious, so the only thing I know for certain about my business is that I will continue to help other businesses and that I will do something creative every day. Find Meghan as rakunshop on all social media…Instagram is her fave by far, but she has twitter, pinterest, and facebook, too. Use the coupon code heart25 for 25% off @ her ETSY shop Rakun!